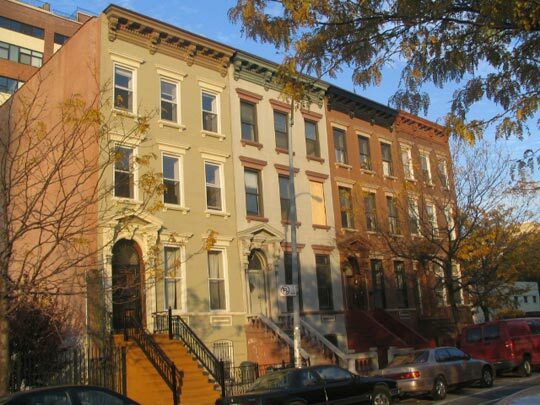 Few Brooklyn neighborhoods have changed as much as has the part of Fort Greene/Prospect Heights just east of Times Plaza, where two of Brooklyn’s longest streets, Atlantic and Flatbush Avenues, get together. When I was attending high school nearby in the 70s, the plot across from the Williamsburg Bank Tower was filled with the dilapidated Brooklyn LIRR terminal, built to magnificent specs in the early 20th Century and left to decay since its last renovation in the 1940s; a Bickfords Restaurant, a long-lost chain; and a line of slaughterhouses and meatpacking plants along the north side of Atlantic between Fort Greene Place and South Portland Avenue. 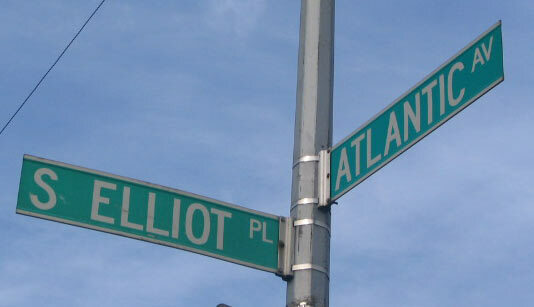 All of it is now occupied by the new Atlantic Center and Atlantic Terminal shopping malls. 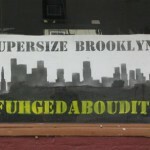 A farmers market formerly on the south side of Atlantic at 4th Avenue is now filled by a big-box retailer, PC Richard. 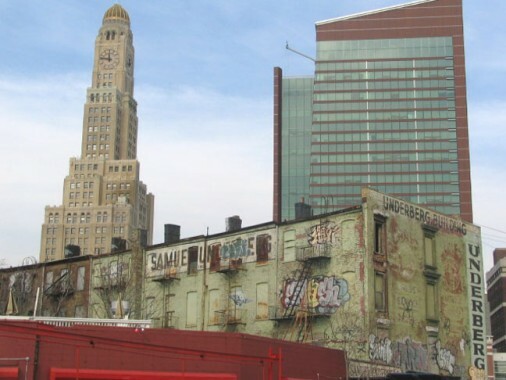 More change is coming to the area, which will largely wipe out a manufacturing and residential area for a couple of blocks south of Atlantic Avenue and between Flatbush and Vanderbilt Avenues. 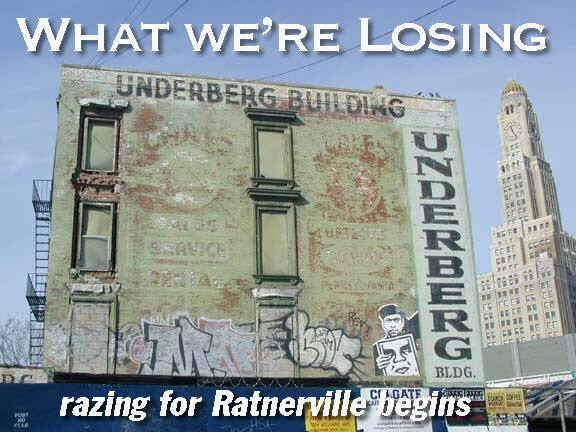 On this page, we’ll show you the buildings that are either would be coming down or will be severely overshadowed by the monster development. 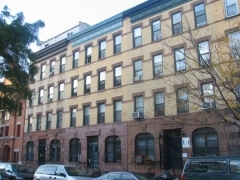 The Underberg Building is a long-time mainstay of the triangle-shaped plot bounded by 5th, Flatbush and Atlantic Avenues. 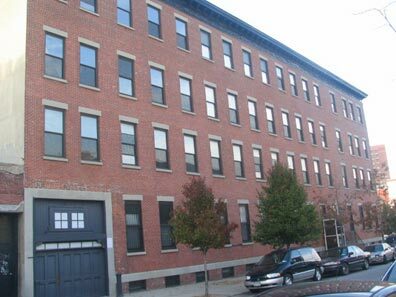 Samuel Underberg is a food supplies company presently located further down Atlantic Avenue at Utica. 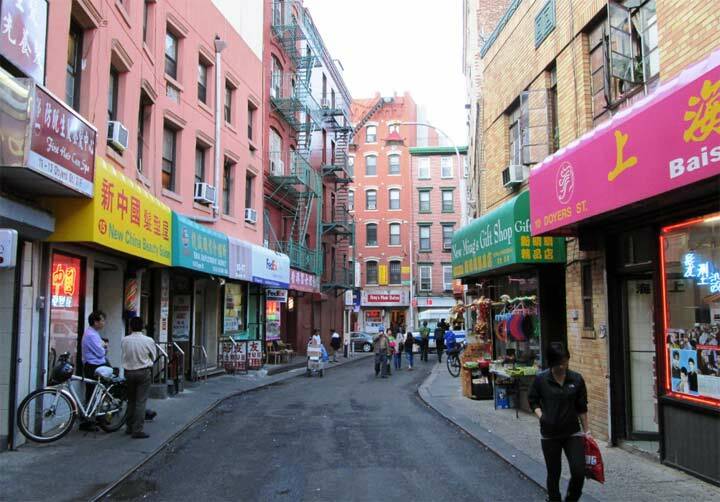 “Underberg” has been immortalized as the title of the opening section of Jonathan Lethem’s novel “The Fortress of Solitude,” much of which is set on nearby Dean Street. Your webmaster has never actually entered the Underberg Building, but it was an integral part of my teen years, since I dutifully waited in front of it, or rather the used-car lot adjacent to it at the apex of the Atlantic-Flatbush triangle, for the #45 bus that carried me past the slaughterhouses, weedy, empty lots, huge manufacturing lofts and gas stations to my high school on Washington Avenue. 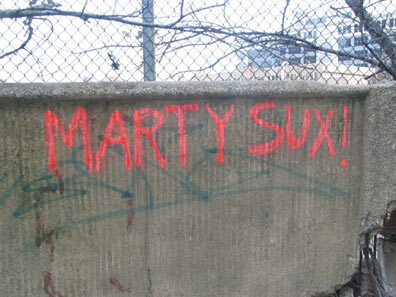 There was no such thing as gentrification then, and the area was mostly near death, with only the occasional twitching to indicate there was still a pulse. Or was it rigor mortis? The Underberg was, between 1972 and 1975, much as you see it today. 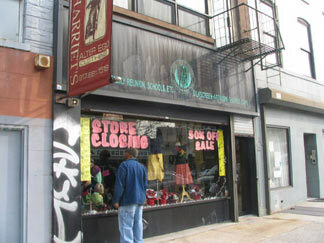 There was a light green paint job along with numerous painted signs to tell you who exactly owned the building. 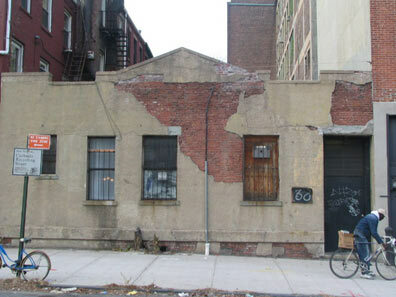 It’s been dormant since the Underbergs moved to a rather more morbid-looking locale further down Atlantic on Utica. 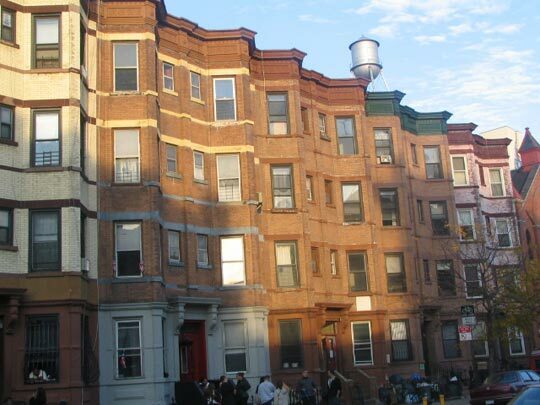 From David Gallagher’s lightningfield letter column: Mr. Underberg was a mover and shaker in the area for many years, involved with B’nai Brith and many other organizations, as a well as being active in boating by Sheepshead Bay back in the 40’s and 50’s. 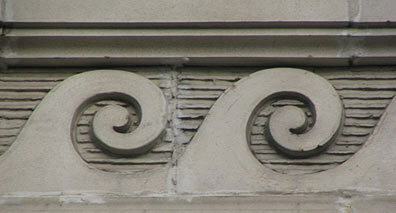 He had a bungalow there as a summer retreat and he had numerous trophies attesting to his boating endeavors. The building itself had people living on the top floors till about 1970, the bottom level housed a company called Samuel Underberg inc. which was a food store supply outfit that would have everything a store would need( carts, signs, stock moving equipment, aluminum goods etc….everything except food) Waldbaum was our largest account, but we would also deal with smaller places such as Balducci’s and Zabars. Mr Underberg passed away around 1983 and his wife lived till 96 years old, and recently passed. 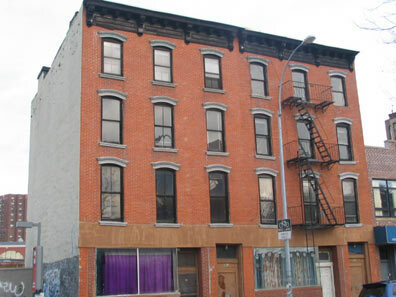 That building was just sold by the Underberg family and even though it was in disrepair, it is a prime spot and they got somewhere near 1 million dollars or so. 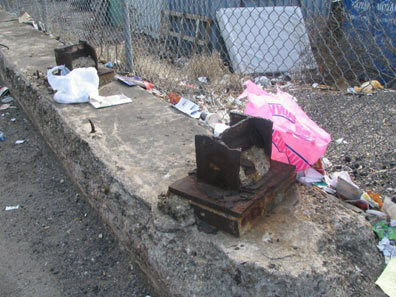 On Atlantic Avenue just east of 5th Avenue in front of the U-Haul lot, you’ll find the stubs of what used to be elevated train stanchions. 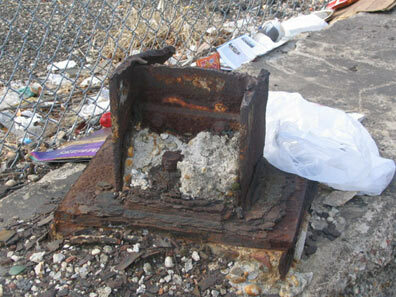 These are the last remnants of an elevatedconnection from the LIRR to a freight terminal located across Atlantic Avenue on Fort Greene Place used by Armour Meats and Rabinowitz Glassworks. 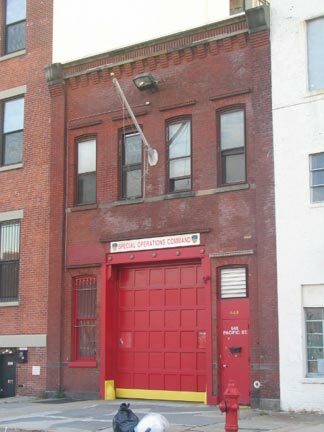 Various segments continued to be seen here and there on Atlantic Avenue as late as the 1980s, but these are presently (2005) the only remnants. 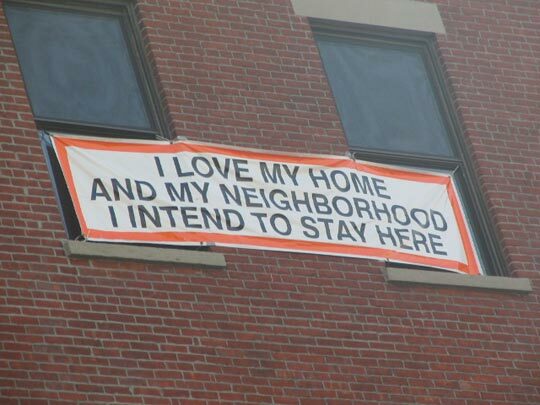 They will likely be ripped up when the new development gets underway. 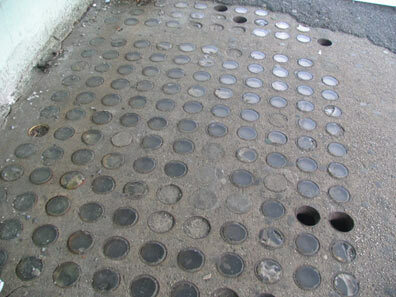 South Elliot Place is a ghost street that the DOT continues to mark here on Atlantic just west of South Portland Avenue. 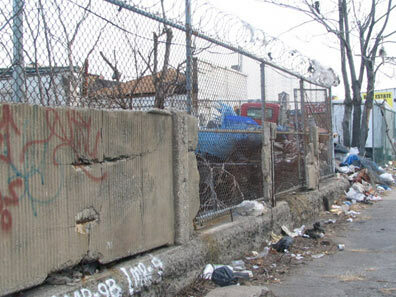 It has not run through to Atlantic Avenue since he construction of Atlantic Center and the Atlantic commons housing projects in the 1990s. 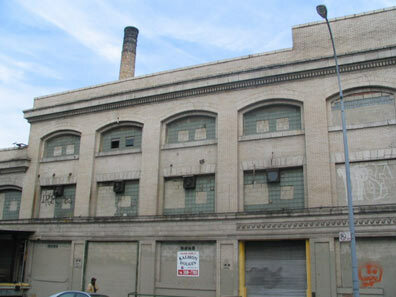 Pacific Street between Flatbush and Vanderbilt would be demapped, with the arena itself located where the street was between 5th and 6th Avenue. 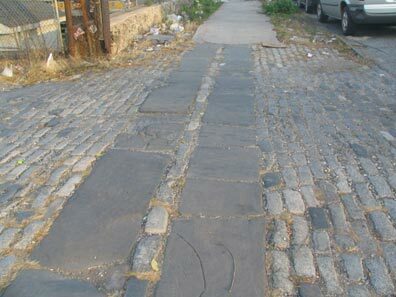 The entrance to the LIRR yards on Pacific east of 5th Avenue is notable for its Belgian block sidewalks and bluestone slate walkway. 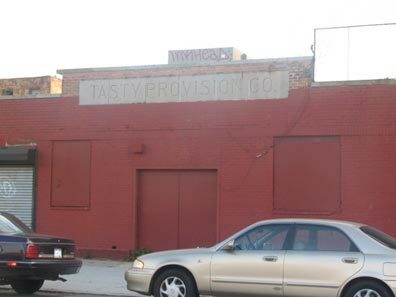 The building marked “Tasty Provision Company” between 5th and 6th is a last remnant of this district’s meatpacking and slaughterhouse past. Armour once had a large operation on the other side of the tracks. 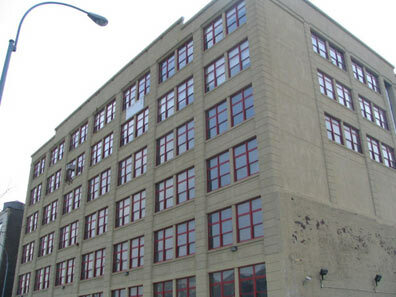 The A.G. Spalding manufacturing building at 6th and Pacific, where they used to make the rubber “spaldeens,” still had its old ID markings when I first visited in 1999. It has subsequently been remade into residential units but is presently under the gun again. Al Spalding (1850-1915), a baseball Hall of Famer, was the first professional pitcher to win more than 200 games, in his late 19th-century career (he won 47 games for the Chicago White Stockings in 1876). 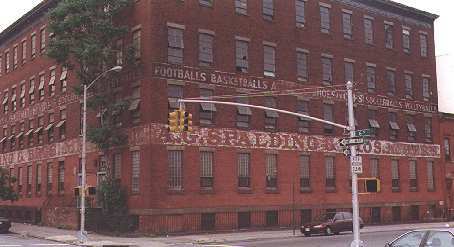 Spalding went on to a successful career producing baseball guidebooksand later, baseball and other sporting equipment. 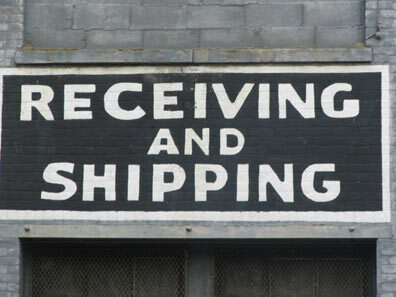 Sign on the Pacific street side. 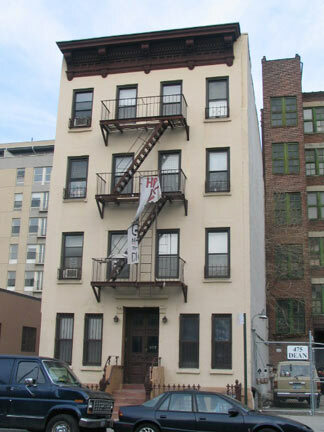 On the other side of Pacific Street on 6th Avenue you will find, naturally, #666 Pacific. 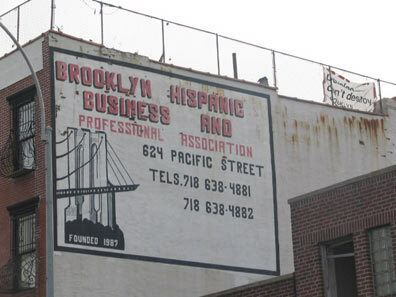 Brooklyn Hispanic Business and Professional Association; and the blue and white terra cotta detail of the Atlantic Arts building, designed by George Kingsley in 1926 (as an Allied Storage facility). 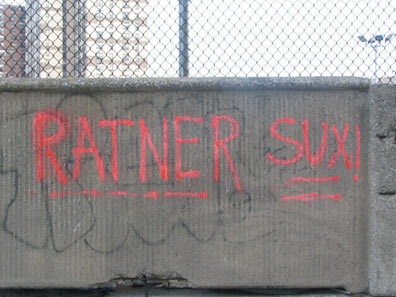 Residents made their feelings known about Atlantic Yards developer Bruce Ratner and Brooklyn Borough President Marty Markowitz, who mostly endorsed the project. 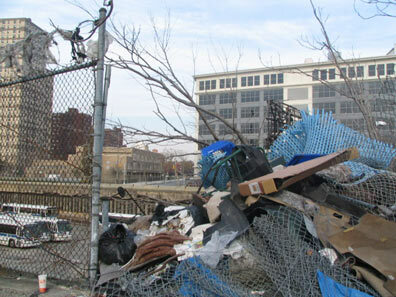 It was obvious that a cleanup was necessary along the stretch of Pacific facing the rail yards near Vanderbilt. Decades of neglect added up. 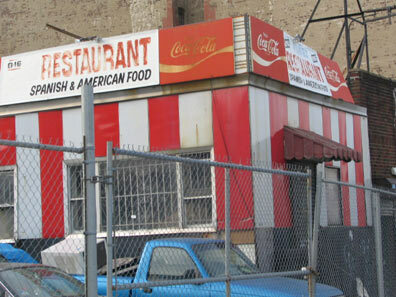 Diner, Vanderbilt and Pacific. That Coca Cola Mobius strip logo is from quite a few campaigns ago. 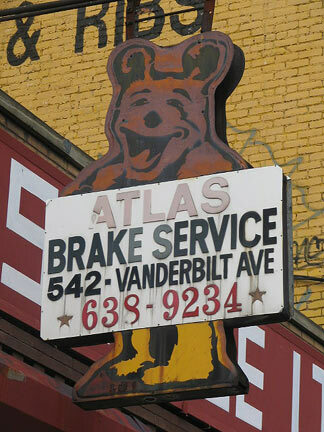 Atlas Brake Service, Vanderbilt and Dean. You know what, I thought I had seen this bear somewhere before. And I had. 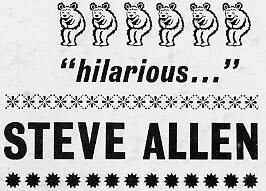 If you sift through your LPs and yank out Allan Sherman’s My Son, The Folk Singer, you’ll see the bear used as a graphic element on the back cover. But whose bear is it? For a PDF file explaining the Bear’s origins, on the Team Bear USA homepage, click on “Team Bear USA-New Prod” in the left-hand menu, then click on the photo of Bear Automotive Safety School. 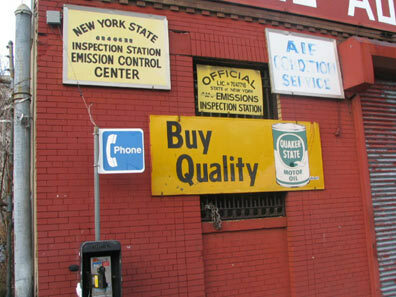 The sign depicted in your photograph is a really old metal sign, probably 1940s or older. 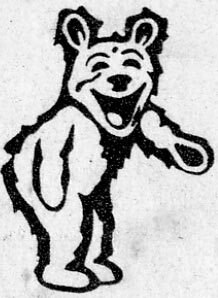 There’s even a Laughing Bear Newsletter (for small publishers) at this website (nothing to do with the Alignment company, of course – they just used a nostalgic logo that would be remembered by many). 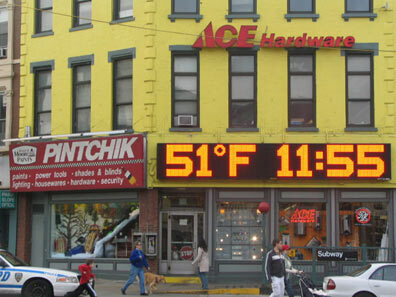 Hot bird, cold world. 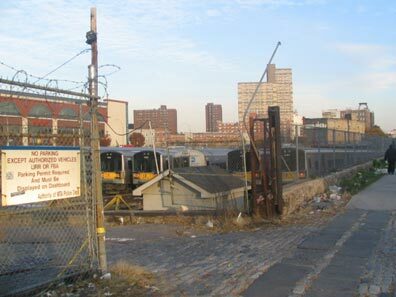 * The Atlantic Yards project will deprive us of the last painted remnants of the Hot Bird chicken franchise, which clucked out in the 1990s. 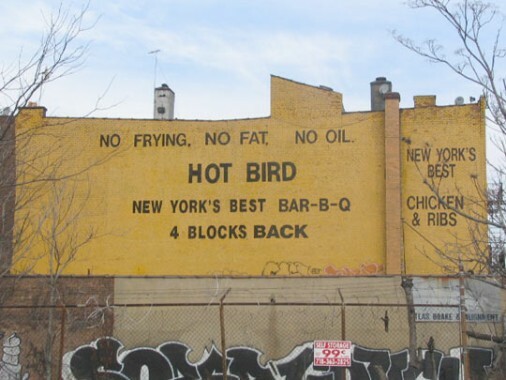 However, the Hot Bird name was too good to keep down, and it resurfaced as the name of a Clinton Avenue club in 2010. *If you can guess the pop singer, his hit that I’m paraphrasing, and what band he was in before the hit, well…I’ll congratulate you. 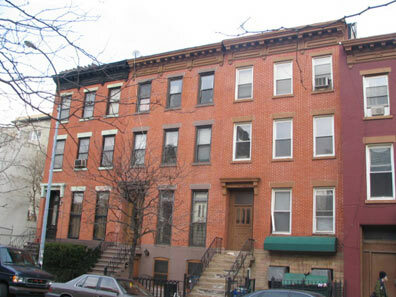 Between Flatbush and 6th Avenues the north side of Dean Street is lined with residences likely to be torn down to make way for the arena. 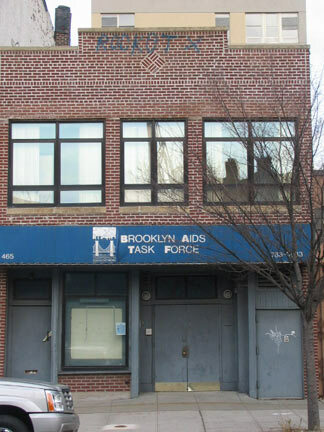 Brooklyn AIDS Task Force is now located in Flatbush. Dean closer to Sixth. 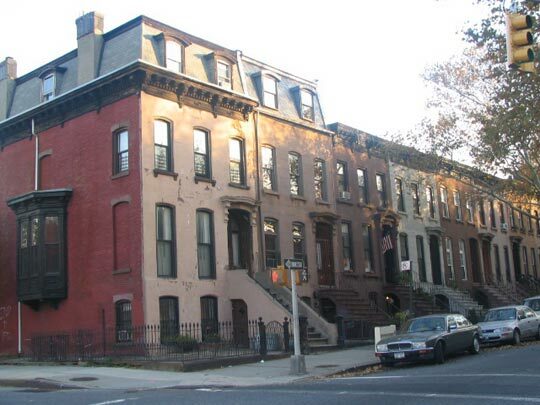 Can’t vouch for the interiors of these buildings but outwardly they seemed sturdy enough to last a few more generations. 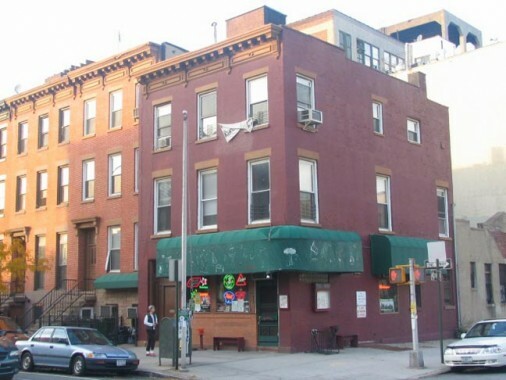 Freddy’s, on the corner of Dean and 6th Avenue, had become an unofficial gathering place for opponents of the Atlantic Yards project. 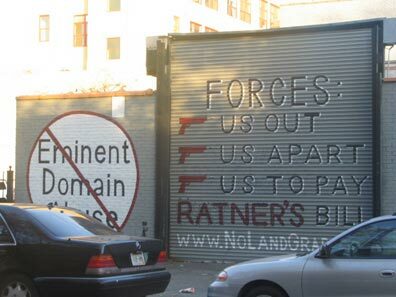 A summer gathering at the tavern by the “antis” was broadcast by PBS-TV (along with comments from project proponents Marty Markowitz and Bertha Lewis of ACORN, the soon to be controversial community organization of low- and moderate-income families). 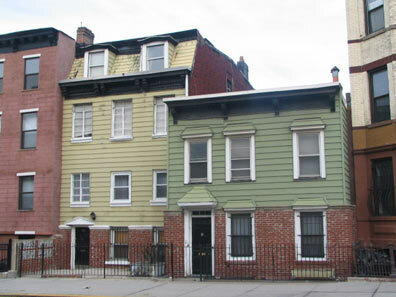 Freddy’s lives at 527 5th Avenue near 17th Street in the South Slope. 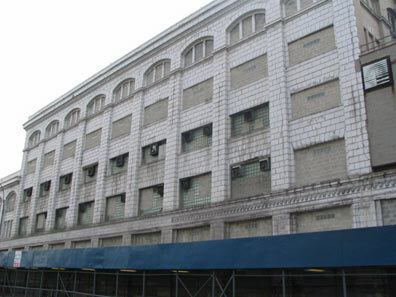 Most of Dean between 6th and Carlton Avenue is not threatened with demolition for Atlantic Yards, but the buildings would likely be overwhelmed by the large-scale project. 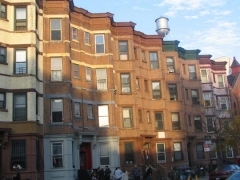 Evening sun illuminates Dean Street row houses between 6th and Carlton. 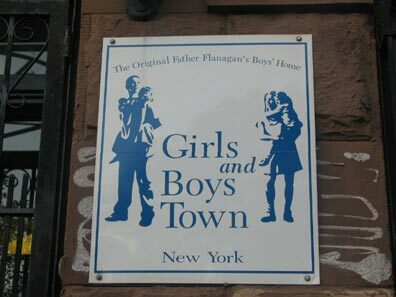 Girls and Boys Town is an 88-year-old (in 2005) organization dedicated, in its own words, to “the treatment and care of abused, abandoned and neglected girls and boys.” It was founded in Omaha, Nebraska in 1917 by Father Edward Joseph Flanagan. 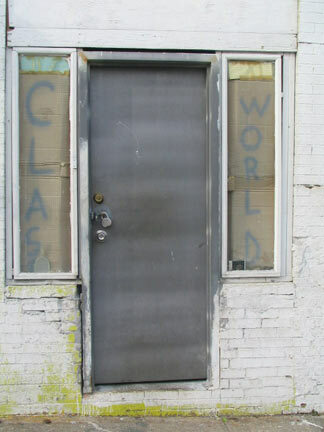 It has a branch on Dean Street midblock between 6th and Carlton. 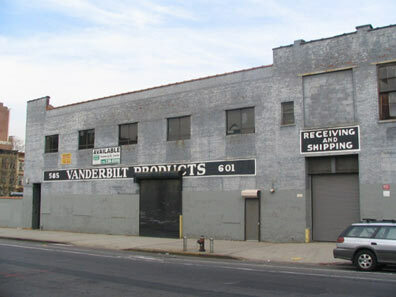 Between Carlton and Vanderbilt Avenues the north side of Dean changes character with mostly warehousing and industrial use (the south side is partly residential and partly industrial). 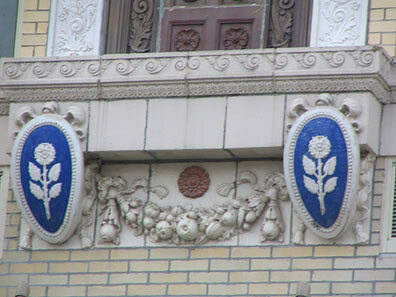 Back end of the Ward Bakery on Dean Street, with terra cotta detail. 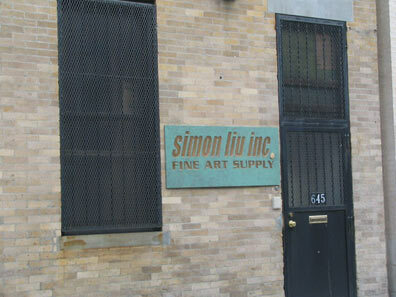 Simon Liu Fine Art Supply is one of the small businesses that had to relocate when the big development arrived. It is now on 2nd Avenue and 51st Street in Sunset Park. 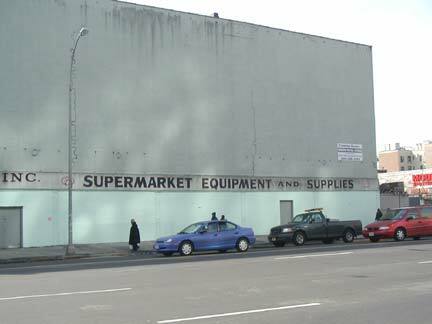 While no Carlton Avenue dwellings (like the ones on the SE corner of Dean and Carlton shown here) are on the chopping block, the small business on its east side between Dean and Pacific is; it has listed a link to one of the leading anti-project websites. 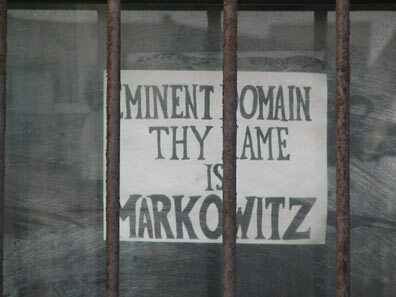 Unusual concrete house on 6th adjacent to Freddy’s has posted a comment about Marty Markowitz. 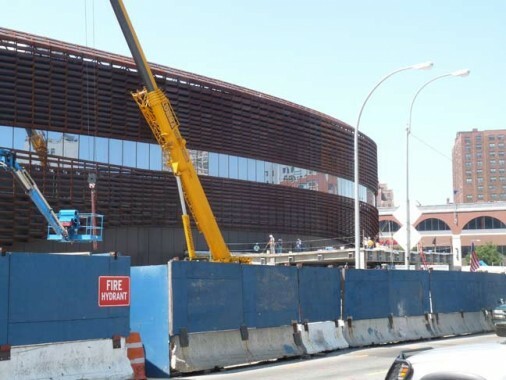 Barclays Center, under construction in July 2012, now occupies the west side of 6th Avenue between Dean street and Atlantic Avenue. 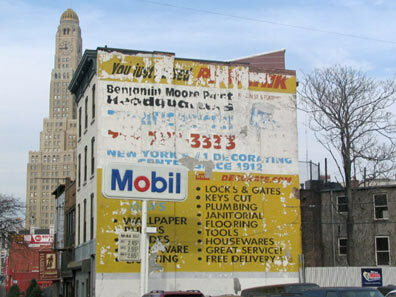 2005: a number of businesses along Flatbush Avenue between Atlantic Avenue and Dean Street would be razed for the project, inclusing a Mobil gas station; Harriet’s Alter Ego, a clothing store, has already announced it is closing. 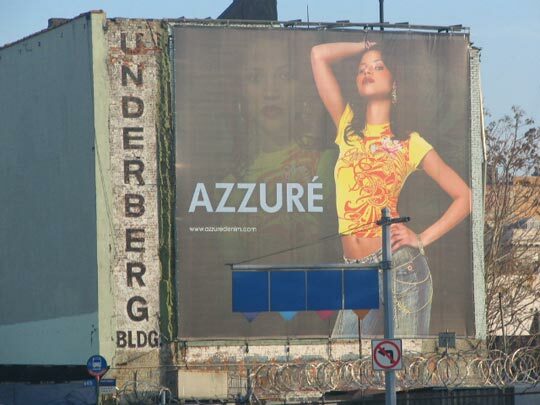 The Pintchik Oracle, an electric billboard located at Flatbush and Bergen, is safe from demolition, and could actually foretell what eventually happens here. The story went that calling from old-fashioned telephone mounted on a wood box on Flatbush Avenue will connect you to a Brooklyn writer, Jonathan Safran Foer (author of the bestseller Everything Is Illuminated), seated inside Pintchik Paints, who would answer your question by displaying the answer on the electric billboard. Photographed November 15 and December 24, 2005: page completed December 25, 2005.